For air inside any building to be fresh, constant ventilation is required in the aircon systems. Without proper ventilation, the same air is re-circulated in air-conditioned space, which gives rise to bacteria, virus and other such germs, resulting in poor air indoors. So ventilation is very important. But ventilation increases cost of air-conditioning. This is where Heat Recovery Wheels operation comes to bail. Klingenburg Hugo Heat Recovery Wheels is a rotary, counter flow air-to-air exchanger designed to provide maximum energy efficiency in ventilation systems where heated or cooled air is exhausted and outdoor air is introduced as make-up. In applications where ventilation is required, energy wheels are used to reduce the initial investment in HVAC equipment and to minimize operating costs. 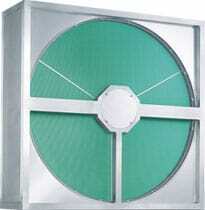 To know more or order Heat Recovery Wheels for your projects, write to us.